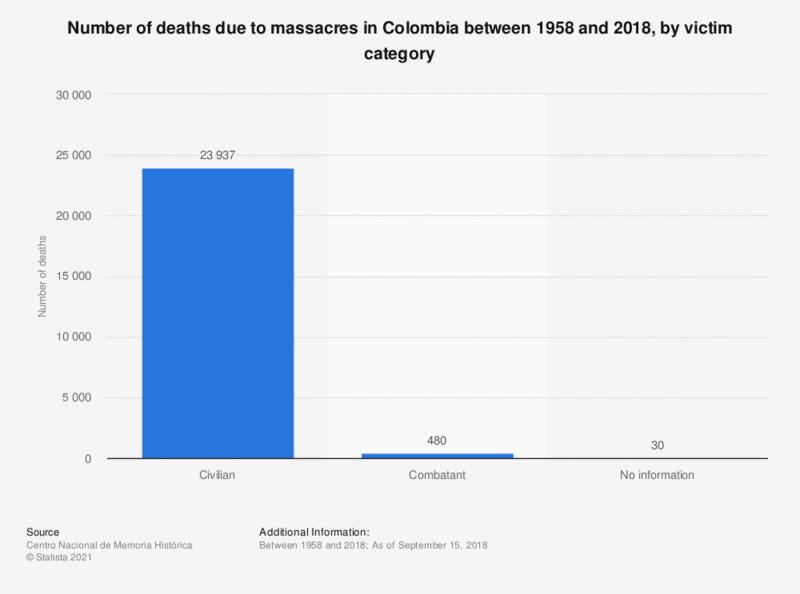 The statistic displays the number of deaths registered as a result of massacres in Colombia between 1958 and 2018, broken down by victim category. According to the source, a total of 24,447 people were killed during massacres in Colombia in the indicated 60-year period, of which 23,937 were reportedly civilians. A massacre is defined as the intentional homicide of four or more people in a state of helplessness in the same circumstances, time and place. It is usually characterized by the public exposure of violence and the asymmetric relation of power between the armed actor and the civil population. The source refers to massacre as the intentional homicide of four or more people in a state of helplessness and in the same circumstances, time and place; and which is distinguished by the public exposure of violence and the asymmetric relation between the armed actor and the civil population, without interaction between armed actors. More information on the methodology available here.